Here are the details of the forthcoming fencing picnic on Monday 29 May (bank holiday), 2 pm start - the pleasure of your company is required! Obligatory for the Monday class. The meeting place: Highbury Fields. It is near Highbury and Islington tube (Victoria line or Silverlink). Walk out of the tube and you'll see Barclays bank on the other side of Holloway road. Highbury Fields are just behind it. Here is the map. Look for people with white jackets and masks. 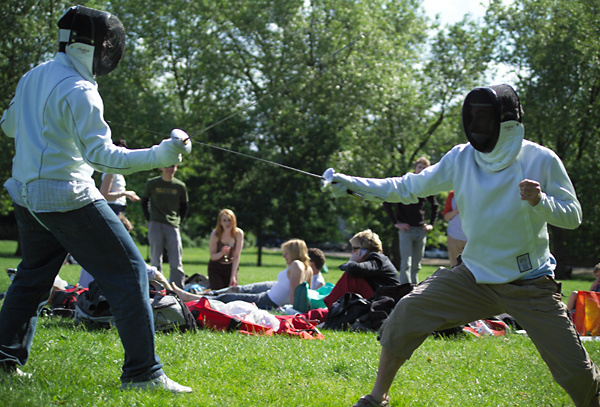 What to bring: some wine and food, friends, a chess set, a dog, and, if you intend to fence, your fencing gear. The programme: The Battle of the Giants (you) :: Fencing while almost Dead with optional Dying with Honour :: anything else you want to do. No picnic if the weather is particularly nasty. The last two years there were showers in the morning but nice and sunny in the afternoon. If looking at the sky on that day you experience any doubts, please feel free to phone me on 07951 414409 to dispel them! Oxana, the former head coach of the national foil team of Uzbekistan, has recently returned to the UK and will be taking part in the club sessions on Mondays. She will be available for private lessons which I highly recommend. Please use the booking facility on the website: there is a reduced introductory rate for her lessons - for limited period only. The last weekend Donna and Rachel represented the club at their first international competition Tournois des Quais de Seine, held at the Stade Pierre de Courbetin and took the respectful 5th place winning two out of four matches. In Rachel's words: "They had new equipment as Paris had bought everything in the hope of winning the 2012 Olympic bid, so the facilities were excellent! And it was really friendly. The organizers welcome us to come back again and bring more London teams... "
Some members are planning to take part in York Open on the week end 27/28 May (I guess you need to talk to Sarah or Roy if you'd like to travel together). Then, if you have some competitive munches, you can consider whether you'd like to enter the forthcoming British Championships on 15/16 July. Traditionally the role of organizing the team and leading it into battle lies with team Captains - and it's probably about time the club should have them! Captain must be a person with the air of responsibility and good health who knows how to win as well as how to loose a fencing bout. I'd like to encourage members to nominate friends or yourselves for this important position! We need at least six captains (men's and women's in all weapons), plus Captains of the Veterans teams!